CLASSIFICATION: - Typical Geographical Indication Sicily (IGT). GRAPE VARIETY: - Moscato di Alessandria, also called Zibibbo. 1st YEAR OF PRODUCTION: - Vintage year 1988. PRODUCTION AREA: - Selected vineyards of the island of Pantelleria. SOIL: - Volcanic origin, very dark and rich in macro and micro elements. ALTITUDE: - Terraces between 50 and 100 meters msl. VINEYARD: Traditional bush-trained, planted in small ditches to protect them against the strong African winds. CLIMATE: - Insular, hot, dry and very windy. VINTAGE: By hand, advanced maturity, the 10th to 20th of September. VINIFICATION: Pressing of grapes super-ripened on the plant and brief contact with the skins. Soft pressing and fermentation at controlled temperature (17° - 18° C.). Once an alcohol content of 5° - 6° is reached,Wine Distillate is added up to approx. 16° to stop the fermentation process and preserve most of the must's sugars. AGEING: - At least 10 months in 225-liter choice oak barrels. MATURING: - At least 8 months in bottle. Colour - bright golden colour with topaz highlights. Aroma - intense and balanced, with clear scents of apricot, elder blossoms and toasted hazelnuts. Flavour - full, smooth and velvety with scents of acacia honey, citron peel, elder, sage and a pleasant finish of fruit in syrup and vanilla. ALCOHOL CONTENT: - 15.5 v %. RECOMMENDED GLASS: - Large transparent, tulip glass. Recommended with: Perfect with baked and dry pastries. Excellent and fine wine for after meals. STORING - Cool (13° - 15° C.) room, not moist, away direct light. LIFE - Up to five years if kept in cellars with suitable conditions. "Wine Enthusiast" has rated the wine "Cantine Florio Morsi di Luce Vino Liquoroso Terre Siciliane IGT, Sicily, Italy" from the vintage 2010 on 10.01.2015 with 89 of 100 points. "Vinum Wine Magazine" has rated the wine "Cantine Florio Morsi di Luce Vino Liquoroso Terre Siciliane IGT, Sicily, Italy" from the vintage 2003 on 01.10.2006 with 16 of 20 points. "Falstaff Magazin" has rated the wine "Cantine Florio Morsi di Luce Vino Liquoroso Terre Siciliane IGT, Sicily, Italy" from the vintage 2003 on 10.03.2006 with 88 of 100 points. "Wine Enthusiast" has rated the wine "Cantine Florio Morsi di Luce Vino Liquoroso Terre Siciliane IGT, Sicily, Italy" from the vintage 2002 on 02.01.2006 with 92 of 100 points. 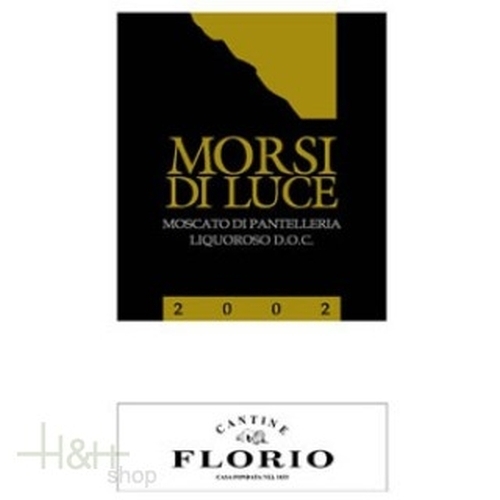 "Vinum Wine Magazine" has rated the wine "Cantine Florio Morsi di Luce Vino Liquoroso Terre Siciliane IGT, Sicily, Italy" from the vintage 2002 on 01.03.2005 with 15 of 20 points.